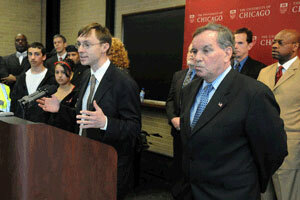 Jens Ludwig, Professor of Social Service Administration, Law and Public Policy, addresses reporters at a press conference, at which Mayor Richard Daley announced a joint research project between the City of Chicago, local philanthropists and University scholars. The project will study gun violence in the city, while identifying ways to help reduce violence among Chicago’s youths. The press conference took place at the University’s School of Social Service Administration on Thursday, April 10. University scholars are collaborating with the City of Chicago and local philanthropists to help reduce gun violence among youths, the City announced at a Thursday, April 10 press conference. Jens Ludwig, Professor of Social Service Administration, Law and Public Policy and a leading authority on crime and social policy, and Harold Pollack, Associate Professor in the School of Social Service Administration, faculty chair of the Center for Health Administration Studies and a prominent public health policy researcher, will lead a team of University and national scholars who will work with the City to develop interventions to reduce youth crime within a research framework that will provide the most scientifically rigorous evidence on effective solutions. The group will seek out foundations and donors in Chicago to finance these efforts, which are part of a larger initiative called the University of Chicago Crime Lab. Ludwig and Crime Lab member Philip Cook, the ITT/Terry Sanford professor of public policy studies at Duke University, have estimated that the costs to society from gun violence may be on the order of $100 billion per year. The impacts extend far beyond those who are directly injured; not only are government resources drained, but safety concerns contribute to the flight of residents from cities to the suburbs. “Shooting victims aren’t the only victims,” Ludwig said. 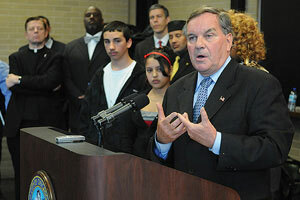 Mayor of Chicago Richard Daley addresses reporters at the recent announcement of the University and City of Chicago’s joint project to study gun violence. The team is developing a range of candidate pilot projects, which will be reviewed with the City, to address these concerns. Program evaluation will be an important part of the University’s involvement so leaders can learn which approach works best, Ludwig said. In partnership with the City, the University research team expects to examine promising new interventions based on previous research as well as interventions already under way. The committee will consider a variety of innovative new projects, which include examining how recently released, arrested or detained youths can complete their high school educations, providing youth with additional rewards and supports for good behavior, enhancing after-school program options for the highest-risk youth in Chicago, refining police patrol strategies and the effective use of police observation cameras, boosting community policing efforts, and dealing effectively with security and truancy. Other Chicago scholars working on the project include Jeffrey Grogger, the Irving Harris Professor of Urban Policy in the Harris School of Public Policy Studies; Jonathan Guryan, Associate Professor of Economics in the Graduate School of Business; Steven Levitt, the Alvin Baum Professor in Economics and the College; John List, Professor in Economics and the College; Thomas Miles, Assistant Professor in the Law School; Charles Payne, the Frank P. Hixon Distinguished Service Professor in the School of Social Service Administration; and Diane Whitmore Schanzenbach, Assistant Professor in the Harris School of Public Policy Studies. Other researchers are Jennifer Hill, assistant professor of international and public affairs at Columbia University; Brian Jacob, the Walter H. Annenberg professor of education policy at the University of Michigan; Tracey Meares, professor of law at Yale University; and Dennis Rosenbaum, criminal justice and psychology at the University of Illinois, Chicago.